Red Hat currently supports only upgrades from Red Hat Enterprise Linux 6 to Red Hat Enterprise Linux 7 for specific/targeted use cases only. Contact your OS vendor and review What are the supported use cases for upgrading to RHEL 7? If your environment does not satisfy these requirements, the procedure described in this guide may not be appropriate for you. For information about other Cloudera Manager installation options and requirements, see Installing Cloudera Manager and CDH. Hue in CDH 5 only works with the operating system's native version of Python when that version is 2.6 and higher. CentOS/RHEL 5 ships with Python 2.4 so you must install Python 2.6 (or Python 2.7) and the Python-PostgreSQL Database Adapter, psycopg2 (not psycopg). If the Hue server is already installed, you must import the psycopg2 connector into Hue's environment or create a symbolic link. Choose Cloudera Enterprise Enterprise Data Hub Edition Trial, which does not require a license, but expires after 60 days and cannot be renewed. 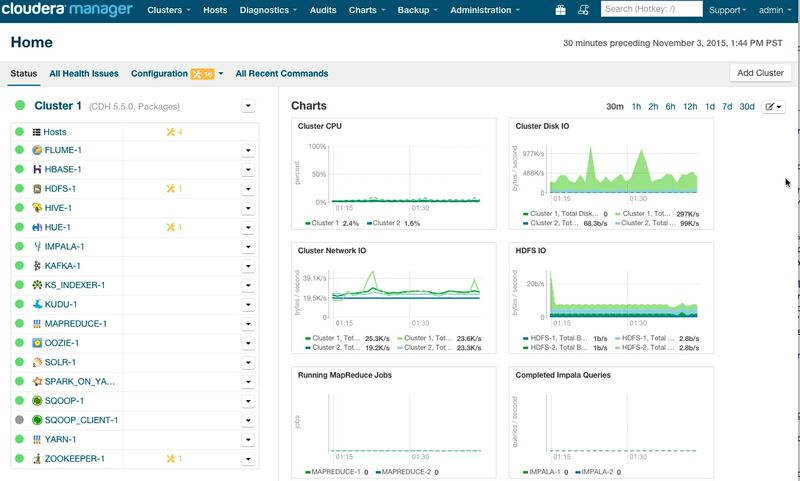 The trial allows you to create all CDH and managed services supported by Cloudera Manager. Click Continue. Click Search. Cloudera Manager identifies the hosts on your cluster. Verify that the number of hosts shown matches the number of hosts where you want to install services. Clear host entries that do not exist and clear the hosts where you do not want to install services. Click Continue. The Select Repository screen displays. Select the Install Oracle Java SE Development Kit (JDK) checkbox to allow Cloudera Manager to install the JDK on each cluster host or uncheck if you plan to install it yourself. Leave the Install Java Unlimited Strength Encryption Policy Files checkbox cleared. Click Continue. The Enable Single User Mode screen displays. Leave the Single User Mode checkbox cleared and click Continue. The Provide SSH login credentials page displays. Keep the default login root or enter the username for an account that has password-less sudo permission. Click Continue. The Host Inspector runs to validate the installation, and provides a summary of what it finds, including all the versions of the installed components. Click Finish. The Cluster Setup screen displays. Select All Services to create HDFS, YARN (includes MapReduce 2), ZooKeeper, Oozie, Hive, Hue, Sqoop, HBase, Impala, Solr, Spark, and Key-Value Store Indexer services. Click Continue. The Customize Role Assignments screen displays. A success message displays indicating that the cluster has been successfully started. Click Finish to proceed to the Home > Status tab. In the Cloudera Manager Admin Console Home > Status tab, click the Hue service.